Weekend Construction Requires Full Closure of Eastbound Dulles Access Highway Saturday, Sept. 22, at 10 p.m. until Sunday, Sept. 23, at 6 a.m.
Saturday, Sept. 22, at 10 p.m. until Sunday, Sept. 23, at 6 a.m.
Beginning on or about Saturday, Sept. 22, at 10 p.m. and continuing through Sunday, Sept. 23, at 6 a.m., Dulles Corridor Metrorail Project (DCMP) crews will be performing overhead pedestrian bridge utility work along the eastbound Dulles Access Highway (DIAAH), requiring the full closure of the eastbound DIAAH from the start of Innovation Center Station at mile marker 1.7 to just east of Centreville Road at mile marker 2.7. 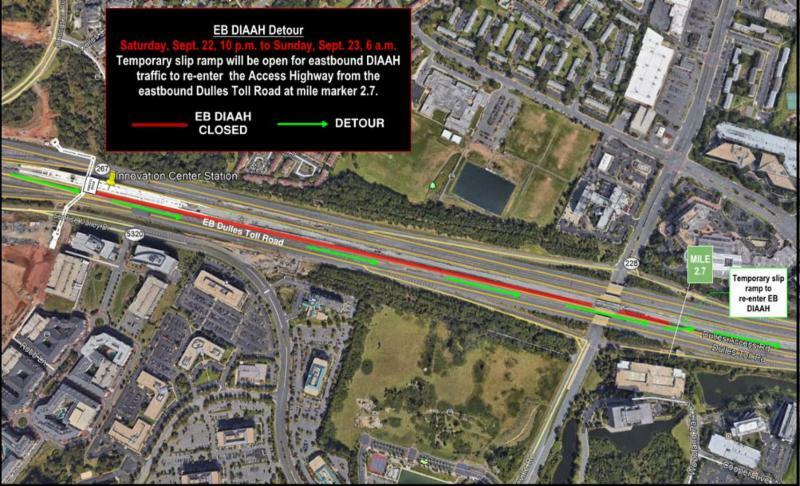 Traffic from the eastbound DIAAH will be diverted to the left lane of the eastbound Dulles Toll Road (DTR), then returned to the DIAAH once past the construction area. DIAAH drivers will not pass through any toll booths on the DTR during these detours (see map below and details on next page). Figure 1: EB DIAAH traffic to be detoured to the left lane of the EB DTR for approximately one mile. Figure 2: EB DIAAH Traffic to re-enter access highway from EB DTR via slip ramp at mile marker 2.7. Eastbound DIAAH traffic from mile marker 1.3 to 1.7 to be diverted to the left lane of the eastbound DTR. Second lane from the left to be a buffer lane between DIAAH and DTR traffic. Eastbound DIAAH traffic will return to the DIAAH at mile marker 2.7, just east of the Centreville Road overpass.